Over 60 vets from around the province gathered at the Glenavon Hotel on 3rd April for the Spring meeting of AVSPNI. After a lovely meal, a brief business meeting updated members on current activities and upcoming events. The floor was then passed over to our speaker for the evening Karin Mueller, Karin spoke about the importance of fluid therapy in farm animal patients. She reminded us of the need to ensure sufficient volumes were given and continued for long enough to permit the kidney to be adequately reperfused and able to deal itself with any remaining electrolyte imbalances. Her second topic covered the basis of blood transfusion and was very helpful in the range of simple practical tips that it included in how to manage what is often an emergency and unfamiliar situation. Her final talk of the night looked at the issue of urolithiasis. Again she had a simple and practical approach to both medical and surgical management of these cases and everyone left more confident about their ability to treat the condition. As a bonus for members who could not attend Karin has agreed to prepare a short recorded talk on top tips for examining a sick camelid. Members will be advised by email when this is ready to be accessed online. 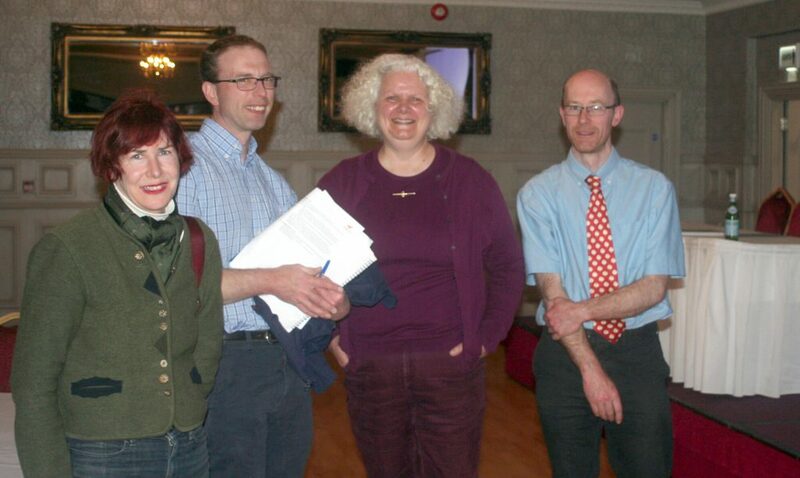 We thank Karin for all her effort in preparing the talks and coming to Cookstown. The meeting would not have been possible without the support of our very generous sponsors MSD and we thank then for their sponsorship and the ‘party bags’ everyone went home with. With all our new beanie hats there will be no more cold heads when out on calls.